How can a friend or client review and comment on a shared LrWeb collection without having to set up an Adobe account? Lightroom Web is the browser-based part of Lightroom Mobile. 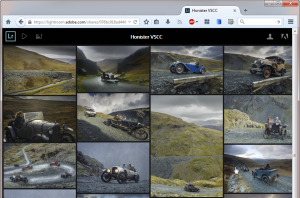 When Lightroom uploads photos (smart previews) to Adobe’s servers for Mobile, they can also be made available to other clients such as a web browser, and that’s what’s being done at https://lightroom.adobe.com/ . When you share a collection via LrWeb, the thumbnails are displayed in this columnar style. LR Web is designed with a Facebook-like mechanism for allowing friends/clients to mark pictures as “Favorites”, and you can use this feature to allow them to select images they might want. These choices appear automatically in LR, and you can add your own responses in LR. One awkward detail is that the client needs an Adobe account. This feature is pretty new and has already changed quickly, so I wouldn’t be surprised if it changes to allow other ways of authenticating comments. But it’s easy to imagine people may be reluctant to sign up, even if the account is free. For now, you can always set up a dummy account and tell people to log in using that user name and password. If you need more than one person to view a set of images, just duplicate the collection and sync it too (this doesn’t mean extra uploading). So, for example, client John might log in using mydummyadobeID and has the URL from the Shoot-John collection, while client David would use exactly the same ID to view the Shoot-David collection. is there a way to disable downloading the “proofs”. People don’t seem to understand the phrase “do not download or share these proofs”. This system is so easy to use and sync to the LR but its getting annoying seeing unedited photos on the web because people can’t follow directions. Assuming you haven’t enabled the Download option in Share…. If they can see the photos in their browser, you can’t prevent them sharing screenshots. Adobe have made it harder to download (ie save) the JPEGs themselves though. If they right click an image, they only get a transparent image overlay, but this won’t stop anyone who knows their way around web browsers. It will slow them down, which is good. But ideally we need a proper watermarking capability. but I think I discovered that this dummy account will only last for 30-days. LR thinks the ‘account’ is trialling LR. After the 30-days it locks access to the web browser image previews. Are you sure? The account I use has never been anywhere near buying an Adobe product. But I just wish Adobe would open this up so people can use Facebook or other logins instead of Adobe accounts.